Hisense 4K projector delivers 100in image from 50cm | What Hi-Fi? The Hisense Laser Cast TV short-throw projector is capable of delivering a huge 4K image when placed just centimetres from a wall. 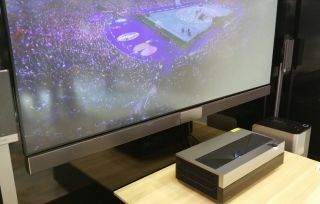 TVs get seriously expensive once you get above the standard screen sizes - witness the £25,000 77in LG 4K OLED - making a projector a more tempting proposition if you want a seriously big picture. Hisense has just the thing, on show here at IFA 2016. The Laser Cast TV is, a) not a TV, and b) a 4K short throw projector capable of delivering a 100in image when around 50cm from a wall. The Hisense Laser Cast TV (LT100) is due out around March/April 2017 and will set you back around €10,000 (naturally, it's not cheap) and can throw a picture to any wall or screen. Hisense also had its own 100in panel on display at IFA, which is already on sale for €1000. Video was coming by way of a USB stick plugged into the rear of the projector, but we were told the machine will also have Amazon and Netflix built-in, along with wi-fi, allowing you to Netflix and chill in front of your monster screen without the need for any additional boxes or streaming sticks.